We’d love your help. 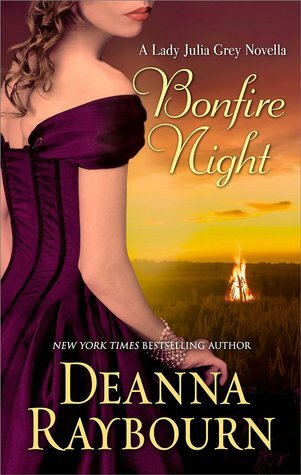 Let us know what’s wrong with this preview of Bonfire Night by Deanna Raybourn. It's the autumn of 1890, and almost a year has passed since—much to their surprise—Lady Julia and Nicholas became parents. Just as the couple begins to adapt, a solicitor arrives with a strange bequest Amateur sleuth Lady Julia Grey and her detective husband, Nicholas Brisbane, face their latest adventure in this novella by New York Times bestselling author Deanna Raybourn. To ask other readers questions about Bonfire Night, please sign up. Is this really the end to Julia & Brisbane's story? I really don't think this book was good enough as an ending to this series. There needs to be one more novel, and use that book to wrap things up. Do an epilogue at that end that takes us into the future with them. I feel a bit let down. Felt this way the first time I read the series...and still do. Amazon tells me that three stars means "it's okay," and that concisely sums up my thoughts on this mildly engaging but highly forgettable novella. My criticisms actually don't center on the length---or, more accurately, lack thereof :) For one thing, I think skilled writers can convey a great deal in relatively few pages. For another, I can't honestly claim I found this a compelling enough story to wish there had been more of it. It's not really a traditional whodunit with clues and suspects---j Amazon tells me that three stars means "it's okay," and that concisely sums up my thoughts on this mildly engaging but highly forgettable novella. My criticisms actually don't center on the length---or, more accurately, lack thereof :) For one thing, I think skilled writers can convey a great deal in relatively few pages. For another, I can't honestly claim I found this a compelling enough story to wish there had been more of it. It's not really a traditional whodunit with clues and suspects---just our characters quickly and easily figuring out why the house they've been summoned to seems 'haunted.' I didn't feel like I got to know our main characters any better, and the minor characters in this one were totally incidental. Oh, how I love Lady Julia! Well, actually, I love Brisbane, her husband, one of the hottest heroes ever in a "clean" romance. Hats off to Deanna Raybourn for her creation. In this very short novella, Brisbane has inherited a manor house from a total stranger, and when the family (Julia, Brisbane, Plum, Portia, young Jane, and baby Jack) arrive there, they discover that it's haunted -- by some rather inept ghosts. High-jinks and mystery ensue. I mourn the demise of Brisbane and Lady Julia and hope Oh, how I love Lady Julia! Well, actually, I love Brisbane, her husband, one of the hottest heroes ever in a "clean" romance. Hats off to Deanna Raybourn for her creation. I mourn the demise of Brisbane and Lady Julia and hope that the author's new publisher decides to pick up the series. Don't read this novella unless you've read at least some of the preceding novels. But, if like me, you have enjoyed the novels, this and the other three novellas are a delight. Nooooo! I just read on Raybourn's blog that this is going to be the last of Julia! I'm so sad. I was still hoping for more full-length novels in the future. Curse those publishers for tabling the series. Still, I'm thankful she wrote the novellas to help wrap it up for readers even though she had to publish them ebook only. I absolutely adore this series, in fact I would go as far as to say it is my favorite historical mystery series out there and sadly, while the author has been working on other books, while all equally as fabulous, this series has been put on hold with just a few splattering of novellas here and there to tide us over. Thankfully all those novellas live up to the rest of the series and have all been equally as wonderful as the actual books and of course, Bonfire Night is no exception. I just love J I absolutely adore this series, in fact I would go as far as to say it is my favorite historical mystery series out there and sadly, while the author has been working on other books, while all equally as fabulous, this series has been put on hold with just a few splattering of novellas here and there to tide us over. I just love Julia, Brisbane and all of the March family. They are quirky and daring and smart and yes, just a bit crazy but all so lovable that it really is hard to say goodbye to them after putting down the newest addition to the series and I have missed them all dearly. So it was no surprise that as soon as I saw the release of this newest mystery I snatched it up immediately and dove right in. Oh how I have missed the wild adventures and situations Julia gets herself in. The chaos and mayhem rival no other and the witty banter between all of the March clan and Brisbane truly make this series so much fun to read and relish. Sigh... fully completed the series...not ready to say goodbye. It was great to check in with the Brisbane's in this short story! The events of Bonfire Night take place towards the end of 1890, when young John Nicholas – Jack - (the baby discovered in the stables at Bellmont Abbey in Twelfth Night) is firmly ensconced in the Brisbane’s nursery. One evening at the end of October, relaxing in their new London home with Portia and Plum, the Brisbanes receive a visit from a shady character who professes himself a solicitor. He informs Brisbane that he has inherited a country property by the name of Thorncross Hall. He’s never heard of it – but the bequest appears legitimate, even though there are some odd conditions attached, one of which is that he must be in residence at certain periods in order to secure the inheritance. One of those periods is from All Hallow’s Eve until Guy Fawkes’ Night, which is just days away. Intrigued, the four of them head to Berkshire where they are promptly greeted with stories of ghosts, ghouls, and things that go “bump” in the night. It’s pretty clear to team Brisbane and the reader that the servants and the villagers are up to something – the question is, what? Our intrepid quartet quite happily sits up late at night simply to enjoy the efforts of the chain-clankers, banshee-howlers and demon coachmen, wondering why the villagers are going to such lengths to try to frighten them away. This is an engaging little story with a nice twist, but once again, it really does require a familiarity with the characters and their past exploits for it to make sense, so if you’ve not read any of the other books in the series, you’ll be at a bit of a loss. I’m going to go off at a bit of a tangent about a little nit-picky something that bothered me. This is the fourth of the holiday novellas in the Lady Julia Grey series. I have really enjoyed these lighter, shorter suspenses in the series that focus more on family and the tender relationship between Brisbane and Julia. It's fun how they take on a different holiday and how it was celebrated in the Victorian era. This is a series that should be read in order as the character and romantic development are series arcs even if the mysteries are solved within each book. The story opens when Julia This is the fourth of the holiday novellas in the Lady Julia Grey series. I have really enjoyed these lighter, shorter suspenses in the series that focus more on family and the tender relationship between Brisbane and Julia. It's fun how they take on a different holiday and how it was celebrated in the Victorian era. The story opens when Julia and Brisbane are entertaining Julia's brother, Plum, and her sister, Portia along with Portia's daughter in their home and a solicitor brings the news that Brisbane has inherited a country estate with the provision that he inhabits the house the period of time between All Hallow's Eve and Bonfire Night. Brisbane and Julia are suspicious, but the whole family is enticed by the mystery so they all pack up and head to the country only to discover they are staying in the most haunted house in England. Its a fun romp until the lady's maid goes missing and Brisbane questions what its all about. I found this one particularly delightful because it provided a delightful All Hallow's Eve romp with Portia and Plum along with the Brisbanes as they encountered a haunted house and a disappearing lady's maid. It's not a difficult mystery and the story concludes quickly, but it has a nice twist there at the end. For those who enjoy historical romantic suspense and husband and wife detective teams, this is a good series to try. The novels offer the more challenging mysteries and the novellas more humorous and light. I wish Raybourn would write more of this series. I really love and miss these characters. This is the last in the Lady Julia Grey series, and I have been putting off reading it because I don't want the series to end. I gave the novella 4 stars but would probably more honestly give it somewhere between 3 and 3.5 stars if it weren't for the fact that it's the last story. The author wraps up most of the loose ends of the previous novella, but the story reads as if she wants the series to end as well. There isn't much of a plot, and the characters aren't as vibrant or witty or full of pe This is the last in the Lady Julia Grey series, and I have been putting off reading it because I don't want the series to end. I gave the novella 4 stars but would probably more honestly give it somewhere between 3 and 3.5 stars if it weren't for the fact that it's the last story. The author wraps up most of the loose ends of the previous novella, but the story reads as if she wants the series to end as well. There isn't much of a plot, and the characters aren't as vibrant or witty or full of personality as they have been in previous books. This review has been hidden because it contains spoilers. To view it, click here. Yeah, we’re never finding out about that letter from Italy, are we? Raybourn clearly thought she was going to write a sixth book in this series, but then didn’t. But anyway, this was a nice short story. I enjoyed everything except the resolution, because in addition to being sick to death of cousin Lucy, I am also bored of Black Jack. I would have liked to see a different conclusion to this story, with new characters introduced. It just feels lazy to keep trotting out the usual suspects. Another short but fun mystery with Lady Julie, Brisbane, Portia and Plum. This is a short story, the last in the traditional English holidays series (silent night, midsummer night, twelfth night and now bonfire night). At 56 pp it is not even a novella, and depends upon reading the previous stories, which are also greater appreciated if you have read the full novels, also in order. What a treat if you haven't discovered this author though! I read this as an ARC as well as purchased the ebook. It is autumn 1890, amateur sleuth Victorian Lady Julia and her detective husband Brisbane have inherited a country property Thorncross in Narrow Wibberly. It is of course haunted but Brisbane had no difficulty solving this mystery. There is the usual witty banter, the eccentricity and mayhem we have come to appreciate and expect, and a warm family feeling completing a holiday book. This is perfect for an afternoon read, a satisfying story to occupy a train (or plane) journey or just a short break in your day. To the Amelia Peabody series of Elizabeth Peters. "I cursed him inwardly. Plum had only ever been third favourite amongst my brothers, and I was reminded why." "...and besides, strange solicitors showing up at odd hours speaks to an intrigue." "In my experience," Brisbane said seriously, "gift horses are usually the ones with the most dangerous bite." "The house was built of grey stone in a haphazard style and betrayed a certain originality of design." "The woman is mad enough to be related to us." "I've only just realised. Little Jack is the first Christmas present my father has ever given me," he said. "And he has given me the only thing of his I could possibly want." Well, it's a Lady Julia/Brisbane book, so I'm there, obviously. To say that I am heartbroken that there won't be any more novels is this series is an understatement. On a personal level, I discovered this series about the time that my mother died, and in between meetings with lawyers and bankers I went to a bookstore to kill an hour. Deanna Raybourn had just done a signing there, so all her books were in stock, and my grief-drunk brain said "hey, that first one was pretty good" and promptly boug Well, it's a Lady Julia/Brisbane book, so I'm there, obviously. To say that I am heartbroken that there won't be any more novels is this series is an understatement. On a personal level, I discovered this series about the time that my mother died, and in between meetings with lawyers and bankers I went to a bookstore to kill an hour. Deanna Raybourn had just done a signing there, so all her books were in stock, and my grief-drunk brain said "hey, that first one was pretty good" and promptly bought them all. (I think there were 3 at that point, plus The Dead Travel Fast.) Spending time with the chaotic yet loving March family brought me tremendous comfort at a time when my own family was falling apart. Bonfire Night was a mixture of joy and sadness for me, as it is the end of a much-loved series (at least for now). I have greatly enjoyed all of the Lady Julia and Brisbane stories from Silent in the Grave onward. Lady Julia and Brisbane are enjoying an evening with Julia's sister, Portia, and brother, Plum. It is late when a visitor arrives, claiming to be a solicitor with an unusual bequest. Brisbane is to inherit a country house from someone who is unknown to him. The catch is that they must t Bonfire Night was a mixture of joy and sadness for me, as it is the end of a much-loved series (at least for now). I have greatly enjoyed all of the Lady Julia and Brisbane stories from Silent in the Grave onward. Lady Julia and Brisbane are enjoying an evening with Julia's sister, Portia, and brother, Plum. It is late when a visitor arrives, claiming to be a solicitor with an unusual bequest. Brisbane is to inherit a country house from someone who is unknown to him. The catch is that they must take possession by All Hallows Eve (only two days away) and remain in residence until Bonfire Night, or Guy Fawkes Day. Of course all the children, pets, relatives and nannies are packed up for a quick trip to the country. Curiosity alone makes the trip necessary. What follows is a complete farce with a village complicit in demonstrating the haunted nature of the house. Everything from ghostly sobs, moans, rattling chains, and phantom carriages to a plague village makes an appearance. Behind all the cliches is a real mystery though: who made the bequest and more importantly, why? Bonfire Night is a short but very enjoyable read. Thanks to netgalley.com and Harlequin/MIRA for an advance digital copy. Recommends it for: those who enjoy Lady Julia Grey mysteries. Well, that sure was a mini novella. Even though it was short, it was a well put together story. Supposidly Brisbane has inherited a country estate because of his excellent work on a case that saved a female friend of the now deceased owner. Naturally Julie & Brisbane along with Portia and Plum head to the estate to see what it's all about. Let me just say I didn't figure out the reason for the deception, but the ending was good. Ultima delle novelle dedicate alla serie Lady Julia Grey! Peccato perché per quanto non particolarmente brillanti (sono raccontini, in fondo) erano l'ultimo filo che mi teneva legata a questa serie che mi è piaciuta moltissimo. Ora non mi rimane che decidere che cosa iniziare di nuovo della Raybourn! Oh, really enjoyed reading this story! A bit sad, since we're not going to get anything more, but such a great story! Not up to par with the other Lady Julia mysteries. Disappointing, especially for the finale of the series. And with this I finish off my re-read of the Lady Julia Grey series. This was another enjoyable novella. A short, quick read, yet not one lacking in a strong, interesting plot. I am so very sad that this is likely the end to Julia and Brisbane's adventures. :( I will miss this series so much. Cute story but I want more! A nice little story about Julia, Brisbane and the crazy March family but I'm left wanting. I wish there was a new full length novel in the works! This is it. I am officially out of Brisbane and Lady Julia stories. I am pretty sad that there aren't anymore but I do think that their story was told so I respect the author's choice. This little novella is cute. The intrigue is more fun than mysterious as the "case" was easily solved. Really this story was just to wrap up the last piece of their story in an entertaining way. I wouldn't say that this is a must-read but if you want an amusing story to occupy you for an hour or two then this one This is it. I am officially out of Brisbane and Lady Julia stories. I am pretty sad that there aren't anymore but I do think that their story was told so I respect the author's choice. This novella takes place on All Hallows' Eve when Brisbane inherits a haunted manor from a man he has never met. Julia, Portia, and Plum accompany him and all of them investigate the many hauntings and happenings. They bring along Portia's daughter Jane the Younger and their child John Nicholas Brisbane. It is all a complex plot orchestrated by Brisbane's very disreputable father which puts both Nicholas and Julia in danger but does finally cement the place of John Nicholas in their lives. New York Times and USA Today bestselling novelist Deanna Raybourn is a 6th-generation native Texan. She graduated with a double major in English and history from the University of Texas at San Antonio. Married to her college sweetheart and the mother of one, Raybourn makes her home in Virginia. Her novels have been nominated for numerous awards including five RITAs, two RT Reviewers’ Choice awards New York Times and USA Today bestselling novelist Deanna Raybourn is a 6th-generation native Texan. She graduated with a double major in English and history from the University of Texas at San Antonio. Married to her college sweetheart and the mother of one, Raybourn makes her home in Virginia. Her novels have been nominated for numerous awards including five RITAs, two RT Reviewers’ Choice awards, the Agatha, two Dilys Winns, a Last Laugh, and three du Mauriers. Her Lady Julia Grey novels are currently in development as a television series in the UK and she launched a new Victorian mystery series with the 2015 release of A CURIOUS BEGINNING, featuring intrepid butterfly-hunter and amateur sleuth, Veronica Speedwell. Veronica’s second adventure is A PERILOUS UNDERTAKING (January 2017), and book three, A TREACHEROUS CURSE, was published in January 2018. A DANGEROUS COLLABORATION will be released in March 2019. Further books in the Veronica Speedwell series are contracted through 2020.